but it's using scientific evidence to prove his existence, Jeff Meldrum, author of "Sasquatch: Legend Meets Science," said Tuesday to Robert Schmidt's ENVS 3600 class. exists," said Meldrum, who works in the Department of Biological Science at Idaho State University. Schmidt, an associate professor for the department of environment and society, said, "How do we assess the evidence for Sasquatch, or the Bear Lake Monster, or even the Loch Ness monster? Science gives us the tools for looking at the validity of the evidence." Meldrum said folklore, prehistoric evidence and aspects of history convey the intrigue of the possibility of an unknown animal such as Bigfoot. "Belief has no role as a scientific question. The question boils down to is there evidence for a biological species known as Sasquatch," he said. Ever since there have been travelers, there have been tales of fanciful, even somewhat unbelievable animals, Meldrum said. He related the idea of describing a giraffe to someone who didn't know about giraffe and how unbelievable that would seem. Similarly, Bigfoot may seem far-fetched when all people hear are stories, he said. Meldrum said the earliest recorded story about Bigfoot is the "Epic of Gilgamsh." He said that story and "Beowulf" both have accounts of a hairy wild man, which he said could be early accounts of Bigfoot. He showed pictures of masks, tribal statues and paintings from different centuries and cultures, and he pointed out the possible correlations to primates and Bigfoot and the differences between both. He said depictions of a creature with very big, human-like hands and feet were showing up in various styles of pictographs. "No history is without myth. No myth is without history," Meldrum said. Sometimes stories were told to serve as a warning to children to not stay out late because of the dangers in the woods, he said. "Are these just boogie man stories? Are these just things the natives tell their kids to keep them in line?" Meldrum asked. "Are these just stories or do they have some thread of truth?" Meldrum showed possible Bigfoot footprint casts and showed the differences in what are believed to be real and fabricated prints. The evidence in the footprints is what he said he finds most compelling. He discussed the realities of the video recording of Bigfoot walking into the woods and said even though people have come out and said they were in a Bigfoot suit, the reality is the body proportions just don't match up for it to be a human in a costume. 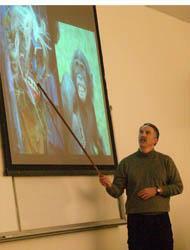 Meldrum told the students at lunch after the lecture that he became interested in Bigfoot as a young boy. He said it was when the video of Bigfoot walking in the woods emerged that he became curious about Bigfoot. That curiosity developed more in later years as his study of science and primates slowly turned into a study of Bigfoot, Meldrum said. He continues his research on Bigfoot and the evidences to support his theory, he said.